JSH Attorneys Win on Appeal from New Trial Order Entered Two Years After Defense Verdict | Jones, Skelton & Hochuli, P.L.C. JSH attorneys Donald L. Myles, Jr., Lori Voepel, and Ashley Villaverde Halvorson, and Jennifer Anderson, prevailed in an appeal overturning a Rule 60(c)(6) order that had set aside a defense verdict in a bad faith case, which was filed by an insured Plaintiff after her house and vehicles were destroyed by fire in 2009. Following a 24-day trial, the jury issued a verdict in the insurer’s favor based on overwhelming evidence establishing that the insurer had acted reasonably: (a) by initially denying Plaintiff’s insurance claims (which were paid in full after criminal arson charges against Plaintiff were dismissed in 2010); and (b) by not turning over to Plaintiff its internal fire investigator’s preliminary C&O report and insurer’s claim file until after privilege issues could be judicially resolved. Lori Voepel has handled over 300 federal and state appeals in virtually every area of the law, including governmental liability, medical and legal malpractice, employment law, civil rights, insurance defense and bad faith, product liability, school law, prison liability, administrative law, commercial law, construction law, airline liability, criminal law, workers’ compensation, and family law. 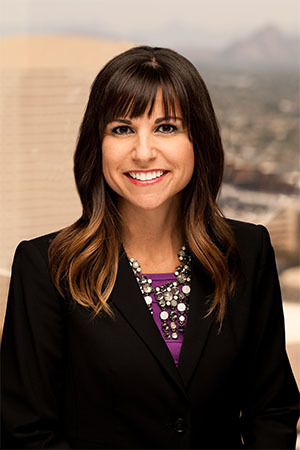 Jennifer Anderson handles federal and state appeals concerning a wide range of issues, including commercial law, torts, insurance, governmental liability, employment, workers’ compensation and family law.